I’ve got five words for you: Four-Ingredient Frittata. Okay, that was three words. Easter’s just around the river bend, folks! What’s on your menu? Normally, when my family gets together for Easter, we whip up the whole brunching spread, including some sort of bacon and egg dish, a funky fresh fruit salad, some crazy Jello thing you don’t want to hear about, and something pastry-licious like cinnamon rolls. 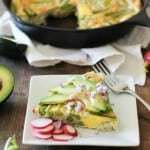 Looking for a fresh idea, I searched Cooking Light‘s website for a frittata recipe. 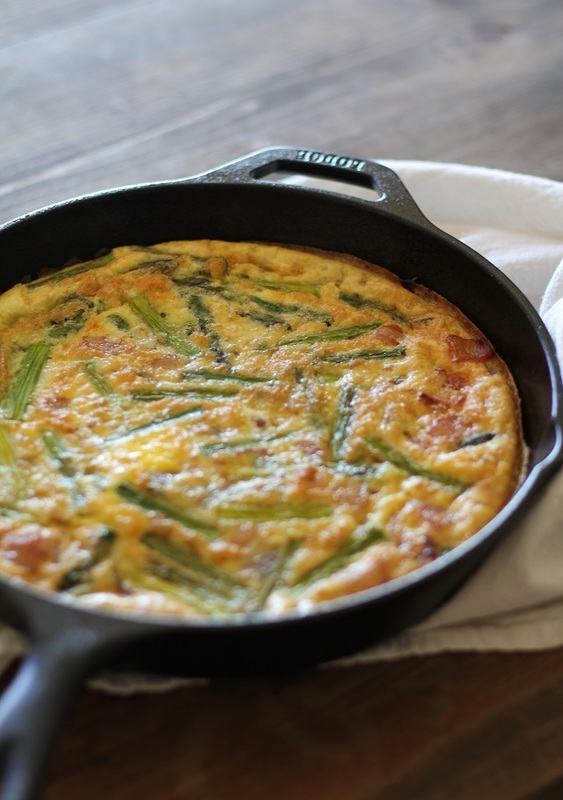 I found their Ham and Asparagus Frittata and knew it was an instant fit. Since I already had bacon on hand, I used it in place of the ham and made some other adjustments. This super simple frittata is puh-retty tastic. The bacon fat is what makes the whole skillet happen if we’re being honest. Seriously, have you tried a bacon-ttata? The drippings lube up the skillet like whoaaaa there, horsey, making serving the thing cinch. Plus, it keeps the eggs super flavorful, moist, and tender. Tender eggs are good eggs. For more brunch ideas, you can check out the recipe roundup I posted last year of Gluten Free Brunch Recipes for Easter. Add the eggs to a mixing bowl and whisk well. Add the chopped bacon to a 10-inch cast iron skillet (or oven-safe skillet) and cook bacon over medium heat until it begins to crisp up, about 4 minutes. 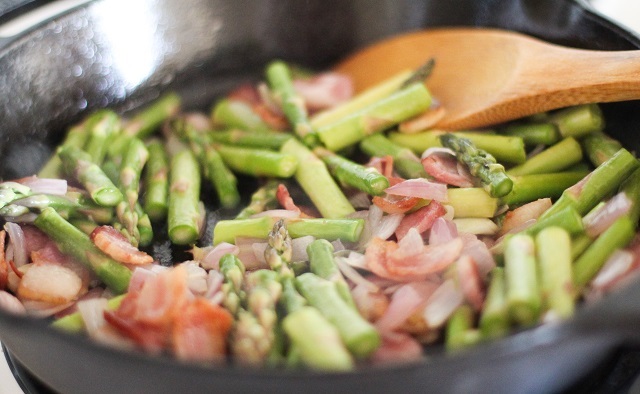 Add the onion and asparagus and saute until asparagus begins to turn bright green, about 3 to 4 minutes. Pour the beaten eggs into the cast iron skillet, and place skillet on the center rack of the oven. Bake for 20 to 25 minutes, or until eggs are cooked through. 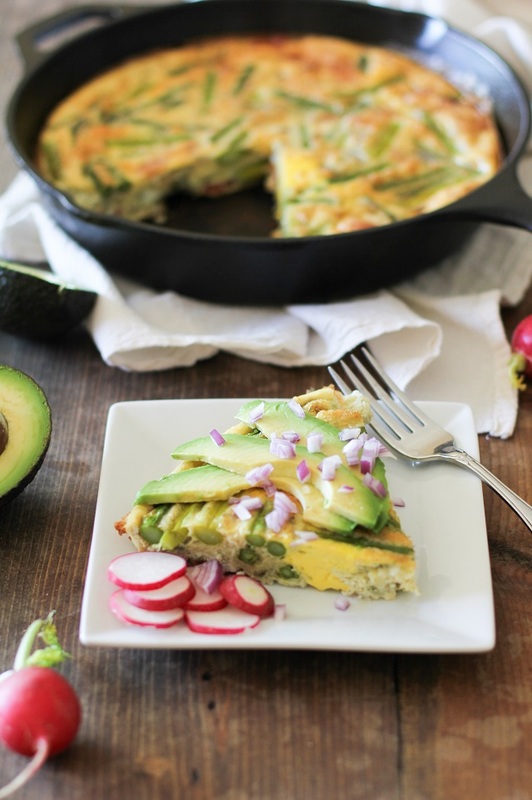 Allow frittata to sit 10 minutes before cutting large slices and serving with avocado and red onion. I love a good frittata! I have never had one with bacon in it, but this is making me want to try it! Perfect for Easter. 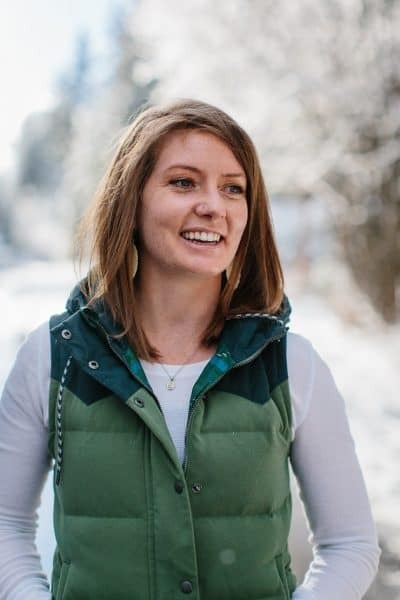 I am kind of jealous of your shot-skiing trip! Bacon fat makes everything more glorious. I want a frittata for dinner. I love how pretty that asparagus looks in that side profile slice pic. Gorg! I am sure you are gonna have fun with your friends in Breckenridge. Please, post picture on Instagram 😉 I am going to Montreal to spend Easter with my in-laws! 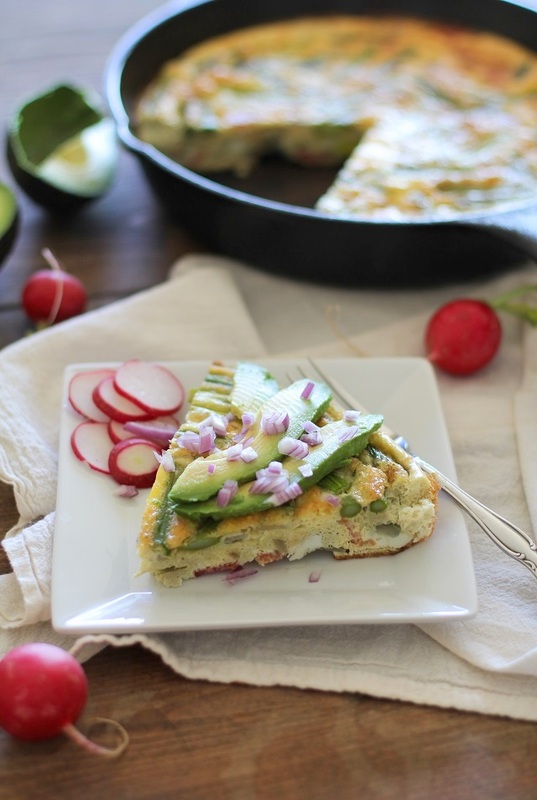 Oh Gosh this frittata looks amazing, Ju! Perfect for Easter lunch! You can’t go wrong with a frittata with bacon! 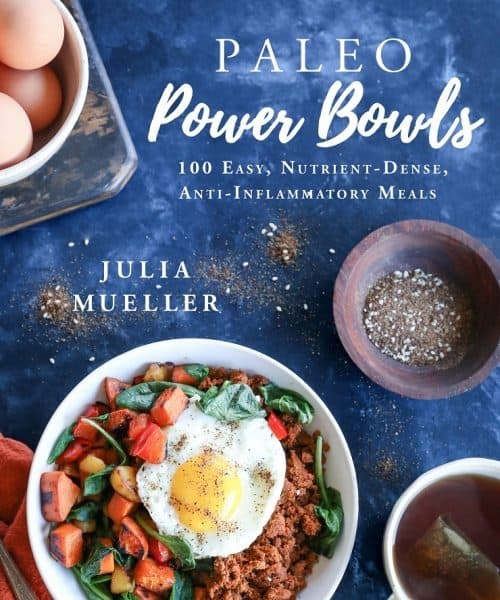 This looks outstanding. What I learned from this post: I need to use the word lube more often in recipe instructions. Also, I LOVE FRITTATAS!